Pasta is one of my first food loves. Thank goodness carbs fuel my internal engines. 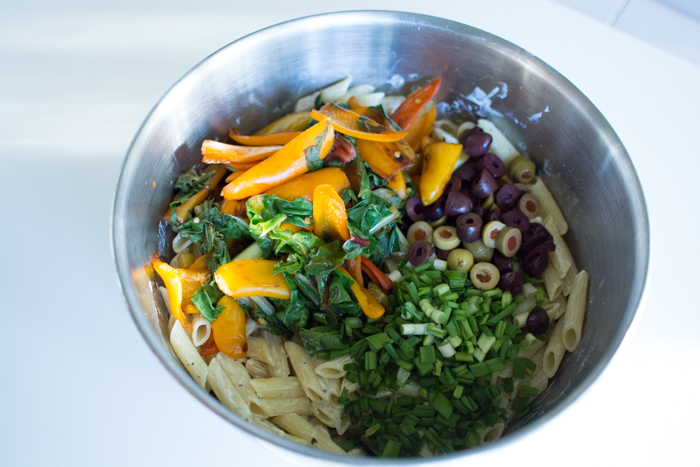 I combined a sturdy penne rigate with fresh swiss chard, mini yellow peppers, fragrant scallions, and fresh basil. In addition to the vegetable flavors and salty tang from the olives there is herbed ‘feta’ tofu—an old favorite—plus a little roasted garlic Vegenaise. Resulting in a not overly creamy Mediterranean-esque pasta salad. A little bit of summer in the middle of winter-if you will. 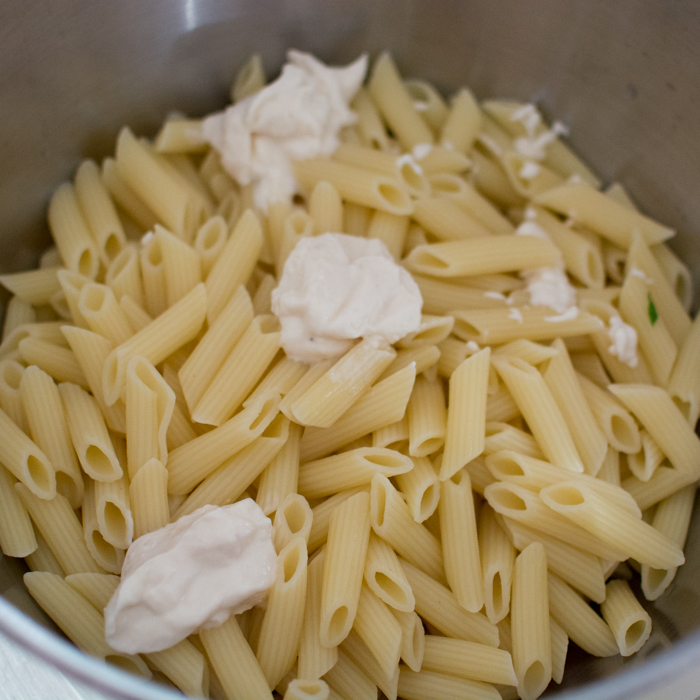 The ridges and hollows of penne rigate attract and hold onto the sauces and spices you add to a pasta salad. Plus they are fun to slide onto a fork. 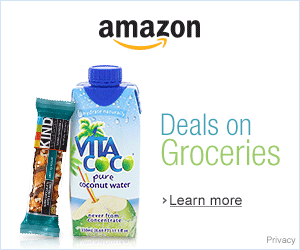 The roasted garlic Vegenaise adds a nice garlic flavor minus the pungency. Simmer sautéing the vegetables in a little broth gives it a boost of extra flavor. Now for the flavor bombs. Scallions. Oh how I love a bright crispy green scallion. And olives. I don’t understand people who don’t like olives. Some homemade sauerkraut would also do the trick. 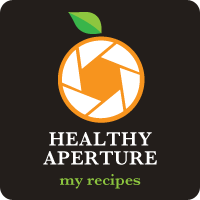 This herbed tofu ‘feta’ adds a cheesy textured protein to our ‘we wish it was summer’ salad. 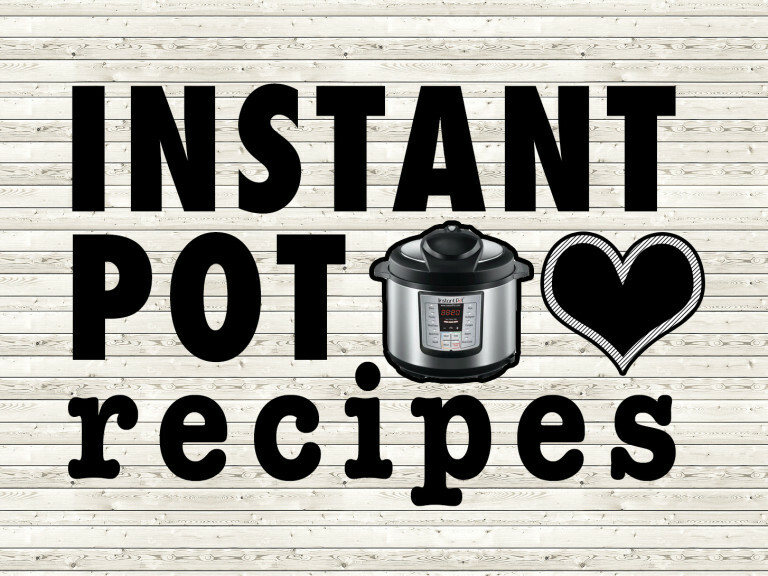 There are benefits to eating greens lightly steamed and raw. This salad gives you a little of both. 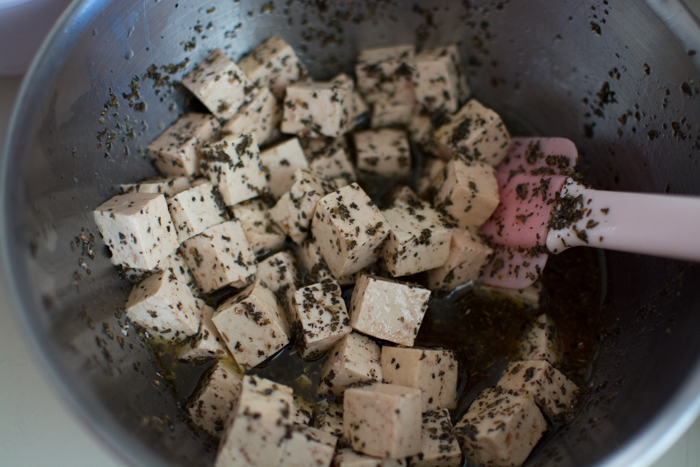 Have we talked about how great the herbed tofu is? Because seriously. Start by cooking the pasta according to package instructions. When pasta is done, drain and transfer to a large mixing bowl. While the pasta is getting started wash and trim the Swiss chard and slice/chop into 1 inch or smaller pieces. Heat up a large non-stick skillet on medium heat, add a 1/4 cup of water (+ whisk in vegetable broth paste if using). When hot add the mini peppers. 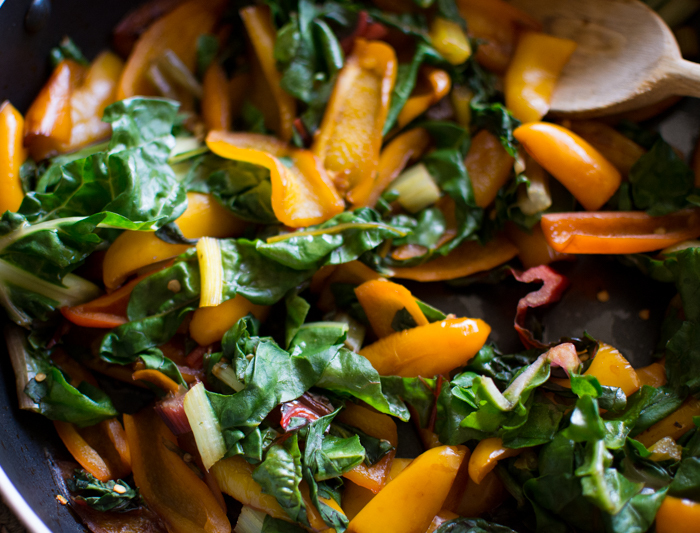 Sauté for 3-4 minutes and then add in 3/4 of the Swiss chard. Cover and steam/sauté for 2-3 minutes or until the leaves are wilted, but still bright green. Remove from heat. 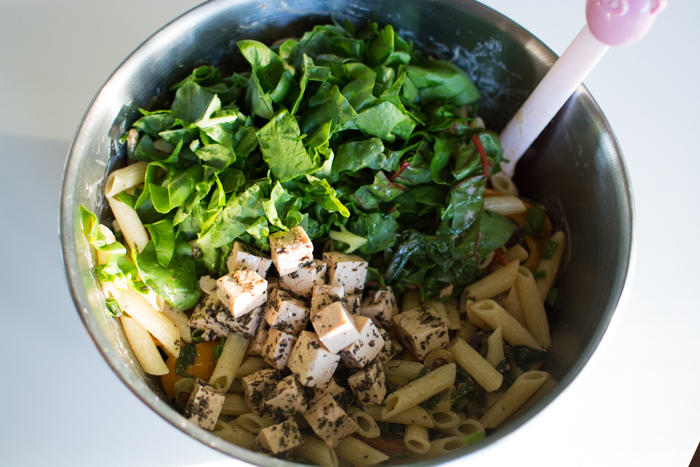 Using a slotted spoon transfer the cooked Swiss chard and pepper mixture into the bowl with pasta. 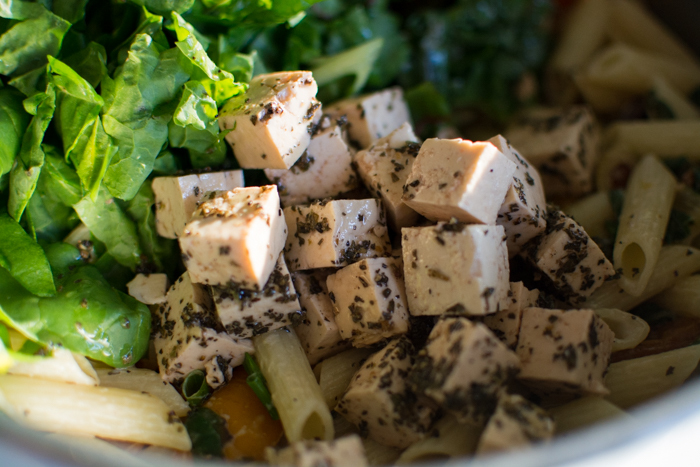 Add in the remaining uncooked Swiss Chard, green scallions, sliced olives, roasted garlic Vegenaise, herbed tofu 'feta', and basil. Mix well to combine. 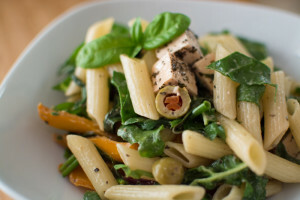 This pasta salad tastes great slightly warm or chilled in the refrigerator overnight.